...so only read on after the cut if you don't mind some pretty hefty story spoilers. First things first, everything we loved about Asylum is present and intact, and the new massive environs add a fantastic dimension to the game that the first game simply couldn't offer. The impressive part is that those same core mechanics work well even in the expanded spaces offered by the streets of Arkham City. The games does just as good of job of making you feel like you are in full on Batman mode, just as the first installment did. The wider canvass doesn't make the game any less fun, and adds that sandbox type feeling to the whole affair. That could have lead to the impact on the main story-line being diluted, and on one hand it certainly is the case that you can set off on a variety of side-missions and get easily distracted from the tasks at hand. 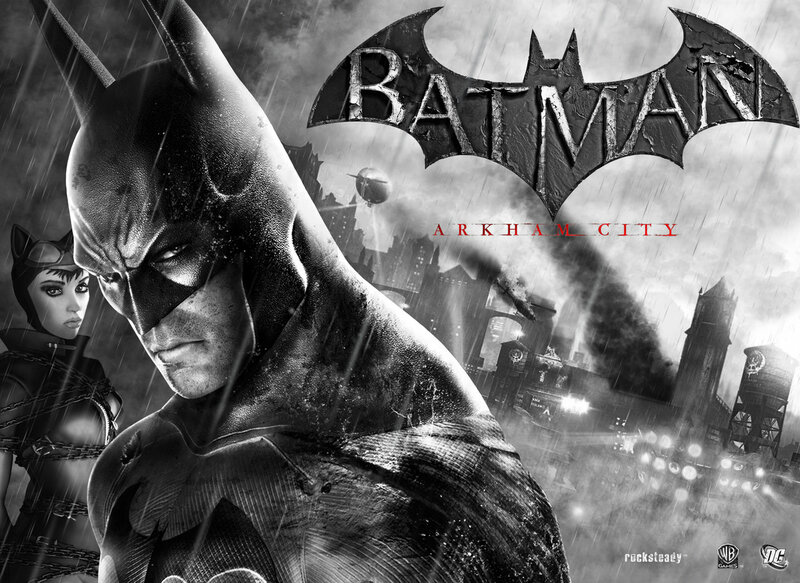 So on all those levels Arkham City is a worthy sequel that does everything a sequel should. In fact I still can't say whether I liked the ending of the game...even almost a week removed from finishing it I can't quite decide if it was an inspired choice that works with the license, or the wrong way to deliver an emotional impact at the end of a game's story. In the first game you really felt like you were locked in an epic confrontation with your eternal nemesis. The conflict with the Joker was the hook which made sure the narrative was compelling. In Arkham City you feel like the designers were so keen to use as many of Batman's enemies as possible, that they managed to miss that central point. Even some of the better moments, the twists and turns in the final act, fall a little flat because you are never quite sure who the ultimate foe is. Several potentially interesting elements, like the possibility of having sympathy for a dying Joker, don't work nearly as well as they should because things crack along at such a breakneck pace you don't feel the build up of suspense in the same way, and even the raised stakes seem strangely hollow (which is ever so slightly ironic considering Batman spends over half the game dying himself from that conveniently slowly acting poison). Characters come and go from that main story-line so quickly, Two-face and Vicki Vale are the worst offenders there, that you wonder if it was really necessary for them to be involved at all, for any other reason other than fan service. The whole 'Batman is poisoned' part of the narrative almost felt irrelevant (Batman would have chased down the bad guys anyway!) and served only as a very loose (and at worst, lazy) plotting choice to drive you to those specific locations. What's even worse, is that in some ways there is a horribly nagging flaw in how it is used, in that it never actually creates a sense of urgency. You soon realize that you won't actually die from it, and you can jump off and explore side missions without penalty, when you are supposed to have mere hours to live. So a mechanic that could have generated real tension and pressure is diluted almost to the point of irrelevance, due to the settings and style of the game itself. If you want to poison someone and create tension, do it in a tightly timed or scripted story section, not an open sandbox where I could spend five minutes or five days getting round to doing the next part of the main story-line. It loses its impact when it provides no real jeopardy. Then you have those final moments. ...killing off a central character in a comic-book franchise is always a challenge of some form. Not least because they are usually ret-coned back into existence when a new editor or creator comes aboard and wants to revisit them....but to be honest I might have actually preferred it if they had killed off Batman himself. As Batman himself notes, he would have saved the Joker regardless, so to have him die in that manner, not even through any choice we made as a player, felt very, very hollow to me when I played through. I feel like the designers missed a chance to have the player actually wrestle with what it means to be a character like Batman...would you save the Joker? would you let him die? To have that dilemma stolen from us by a cut scene was deeply disappointing. Games are an interactive medium, and as much as a designer might want to create what they think is an ultimately powerful moment (in this case the death of Batman's long time nemesis), the real power in the medium lies in letting the player make those choices. For some players letting him live might have been deeply satisfying, while others would get their pay-off from offing the demented psychopath once and for all. When the mechanics do such a stand-up job of putting you in the boots of the caped crusader, it is a shame that the narrative doesn't trust you with his choices. So to wrap up, I thought Arkham city was a really good game, with great mechanics, that is well worth playing, but one that essentially missed a lot of opportunities to have a more compelling narrative. So if you approach it purely for the sheer fun that the mechanics provide, then you will not be disappointed in the slightest. It is still a very rewarding game-play experience. It also offers great value for money with masses of side missions, as well as the Riddler rooms and challenges (some of which are brutally hard). It's fun, polished and slick. However for me it also highlights some of the challenges of narrative designs for games, and misses a trick or two that could have made it a truly great game. I have to agree with you. AC was an amazing game, but the story was just so chock full of damn plot-holes, it wasn't funny! Mr Freeze going from enemy to friend, to enemy to suddenly forgiven and working for you again. WTF! Let alone the whole Joker is ill, no he isn't, yes he is, no it isn't, no, it was just Clayface! *sigh* I felt the story was quite poorly done. I also had an issue with playing most of the game in that damned detective vision mode! The end of the game was just such an anti-climax. I had fun with most of the game, but the ending was a real let down. That said however, the Riddler sections are inspired, it is such a weird choice that they are optional when they are possibly THE most fun to be had in the game. I had friends who finished the game without even finding the extra Riddler rooms, and that is the worst shame with the game. Nice write up - have you tried Skyrim yet? Totally different type of game of course, but I'd be curious what your opinion is of the way they tell their story, and there is Uncharted 3 as well. It has been a great month for gaming all around! I just wish you guys would hurry up with House of Crom, there is so little for max levels to do in AoC now once you are done with Khitai - you lot need to give us something new to do!